Fitbit Versa is the world’s simplest, most intuitive smartwatch that guides you on a personalized path to health & fitness by empowering you with daily motivation and helping you find balance in your life. It is the smartwatch flexible for all. The watch aims to be the world’s simplest, most intuitive everyday timepiece for active people looking for personal guidance to reach their health, fitness, and wellness goals. The Fitbit Versa is the latest, most successful smartwatch offering by Fitbit. Named “Versa” for it’s versatility in offering a stylish, yet personalized user experience. Versa is a huge step forward in style, comfort, and aesthetics– often being mistaken as an Apple Watch. The form factor is slimmer and more sensitive to a wider variety of wrist sizes in comparison with the Fitbit Ionic, and can be personalized with a variety of band accessories and clockfaces. The watch was designed to feel accessible, friendly, and sleek. I was brought onto the Devices UX team to deliver the next generation of user experiences through Fitbit OS. 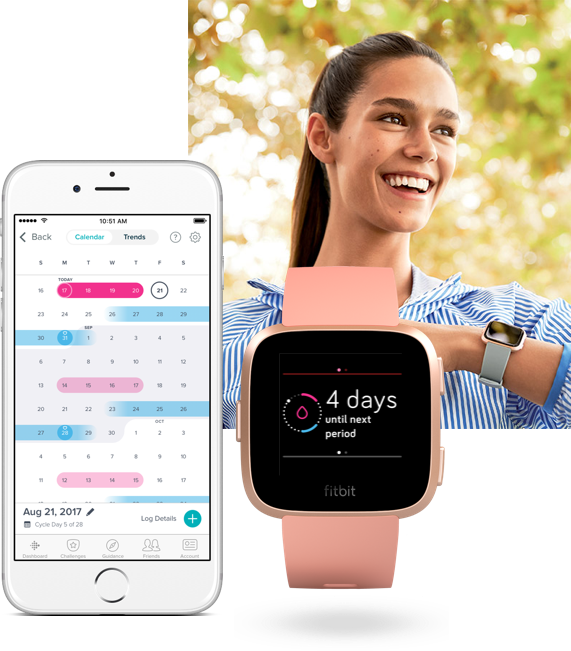 Deliver an exceptional smartwatch experience through the Fitbit OS platform that enables quick actions, raises awareness, and provides guidance to empower users to reach their goals and balance their busy lives. Versa was incredibly important to Fitbit in delivering an affordable, yet powerful smartwatch that leverages the data we currently track and making it a centerpiece of the device experience. As the Lead Product Designer, I was intentional about what information belonged in focus and which features could take a back seat. 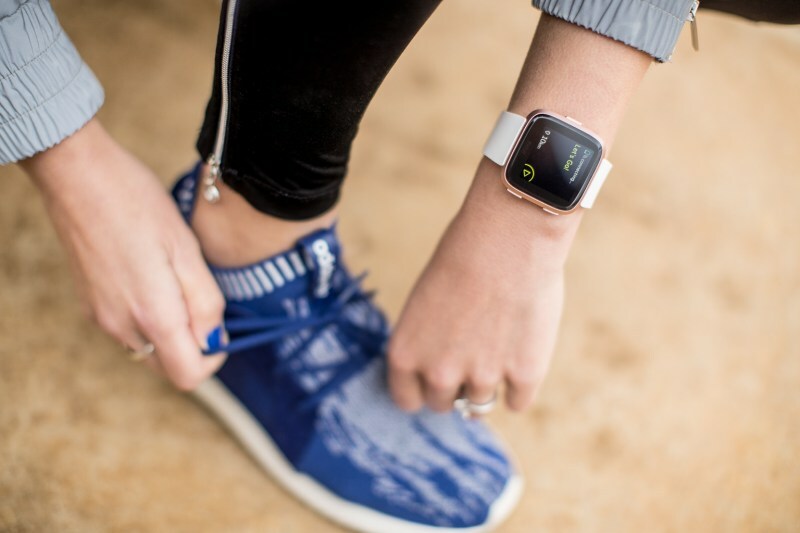 Versa and Fitbit OS were designed to prioritize fitness, health, and wellness features– playing to our strengths and fulfilling the high expectations users had of us as a brand. Each day I advocated for meaningful, actionable, and clear data experiences on wrist so people felt empowered to live their best lives. 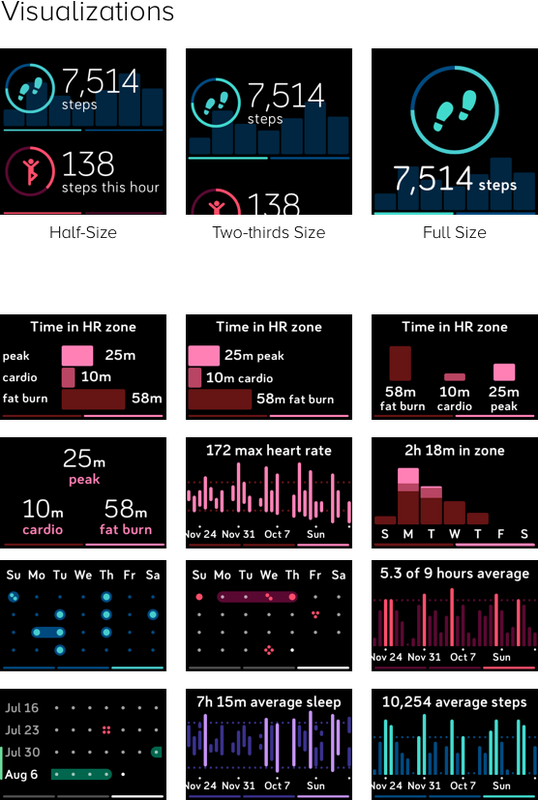 Below is only a selection of what I worked on for Versa and Fitbit OS. Please reach out to me if you’d like to hear more. The re-design of the smartwatch navigational model to be health, fitness, and wellness first. Supporting mental models for lives on the go. A holistic perspective on understanding personal health stats and taking action, while increasing awareness with a simple glance. On-wrist cycle tracking to give women more control over their health. Interactive onboarding experience for new users and firmware updates. Contact me to learn more. Quick-action features – music controls, payments and shortcuts – for lives on the go. Contact me to learn more. Designed Fitbit Pet, a tamagotchi-inspired digital pet clock face made to motivate their owners. Contact me to learn more. Fitbit's Today App is the centralized home for all of a user's tracked stats, progress towards goals, and inbox for guidance & inspiration. Historically, the Today App was a static dashboard of numbers. I was challenged to re-design this center holistically, and restructure the app to grow in order to serve more relevant & actionable content within a simple glance. Provide better access to health and wellness data on wrist by achieving greater parity with the mobile dashboard data. Build the foundation of a flexible and adaptive place that caters to our users’ journeys. Provide a channel for relevant Fitbit guidance and messaging. How might we provide detailed & clear data on-wrist without becoming overwhelming? 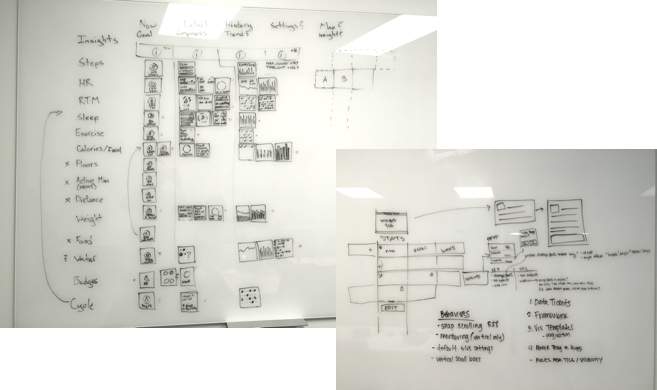 I worked with a visual designer in exploring structure, behaviors, interactions, priorities, logic, and visualizations. We pushed the boundaries, got feedback from the design team and conducted hallways tests. The updated Today App launched with FitbitOS2.0 for existing Ionic users and for new Versa users. Data users cared most about was now easier to access and is flexible to change for each person. With a quick glance, you can see your stats, learn some tips & tricks, and be inspired to hit your health and fitness goals. This was a massive project filled with challenges and learnings. I’d be happy to discuss it more in person. I’m most proud of one specific tile I designed– female health tracking. Scroll down to see more about that project! 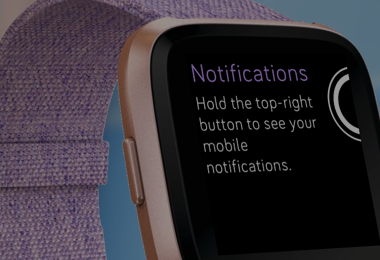 Intent: Define a unified navigational model across future Fitbit devices. Based on preliminary research, the wearables UX team identified key guidelines to design by. These guidelines, as well as prior learning from research, were top of mind when brainstorming the unified navigation model. • Music controls needed to be accessed anytime, from anywhere and was hard to invoke from a global swipe down. Through sketches, wireframes, meetings with stakeholders, and collaboration with research teams, we came upon pivotal changes to the original FitbitOS navigation. This change would not only affect our existing in-market products, but these changes also had implications on the future of our devices going forward. • Users have quick access to see their stats & health info from the Today App with a simple swipe up from the clock. • Quick actions like music controls, payment cards, and settings are now accessible anytime, from anywhere with a simple long-press. The final outcome of navigational changes were profound in giving people better access to data they cared most about. 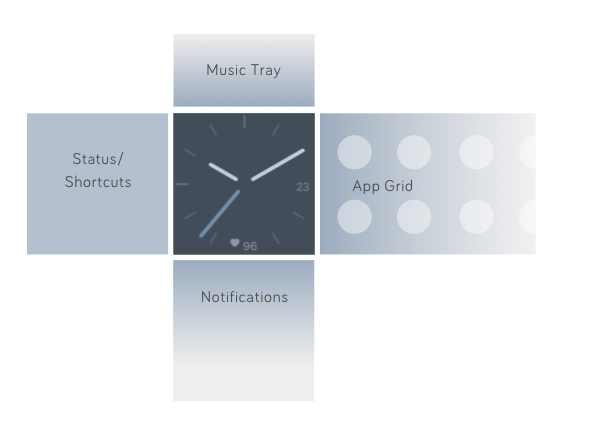 The clock in any smartwatch is the center of the experience, and with simple swipe and button-press gestures, users were now getting information faster and easier. The Fitbit Today app is already seeing higher engagement. Our research shows us the more people are aware of their progress towards their goals, the higher their motivation and likeliness is to achieve them. Role: Lead Product Designer. Project Timeline: 2 weeks. Collaboration with: Product Designers, Visual Designers, Design Managers, Directors, Product Manger, UX Research. Women rock. So should the products they use. Integrating cycle tracking onto the device empowers women to take control of their health and better understand their bodies so they can reach their goals. For the first time ever, Fitbit devices are equiped with on-wrist tools to help people stay on track with their lives. In May of 2018, female cycle tracking will be available in the Fitbit mobile app and in the Today app. I worked with the software team in designing the on-wrist female health experience to launch with the mobile feature’s release. Designing this feature was eye-opening and a meaningful step forward in providing support to such an important part of women’s lives. Designing for future hardware is an exciting challenge because no one company has established standard behavior and interaction models yet. These projects have allowed my skills and approach to design to grow tremendously. I hope you enjoyed the work I did for Versa and FitbitOS. I’d be happy to discuss my experiences more in person. Building upon a new platform for multiple hardware forms, and defining core interactions that balance human factors across transient states was a challenge I eagerly accepted. I was confident in my mobile, software design experience, however I was humbled each day as I learned to design for a small form factor and partnered with engineers building a platform from the ground up.